A Slice of Life: I adopted a pet ! I adopted a pet ! ..... yes i did but only it is a virtual one hehehe. I am not really a pet lover ever since bec. i don't think I have the patience or the passion for taking care one 24/7. I just admire pet lovers bec. they put hearts over them, who knows maybe one day i can be a pet owner. 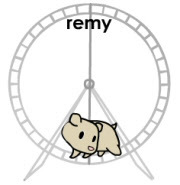 Anyway, like i said i adopted a pet, actually it's a hamster and i named it REMY (my previous post), just like the real hamster that my nephew has. You can see her at the right side of my blog, just scroll down until you find her waiting to be played. You can even put her on the moving wheel and feed her with a strawberry by clicking the MORE button.